FIFA issued a dire warning to Greek football on Wednesday that the sport in Greece sits on the edge of a precipice and signalled the real possibility of expulsion of Greek clubs and the national team from international competitions. Chairman of the FIFA Monitoring Committee Herbert Huebel flew into Athens for emergency meetings with Greek Government and Hellenic Football Federation officials, in the aftermath of the suspension of the Greek Super League following the notorious pitch invasion by armed PAOK owner Ivan Savvidis and his bodyguards in protest of a disallowed PAOK goal in Sunday’s top of the table League match against AEK. Huebel held meetings with Greek Deputy Sports Minister George Vasiliadis and EPO President Evangelos Grammenos. Following last Sunday’s pitch invasion by Savvidis and his bodyguards at Toumba, which made news all over the world, the Greek government announced the indefinite suspension of the Greek Super League ( until further notice), whilst the EPO launched disciplinary procedures against Savvidis and PAOK which could carry severe penalties for both club and owner. In addition, the European Club Association (ECA) announced the provisional suspension of PAOK FC, from the ECA membership. 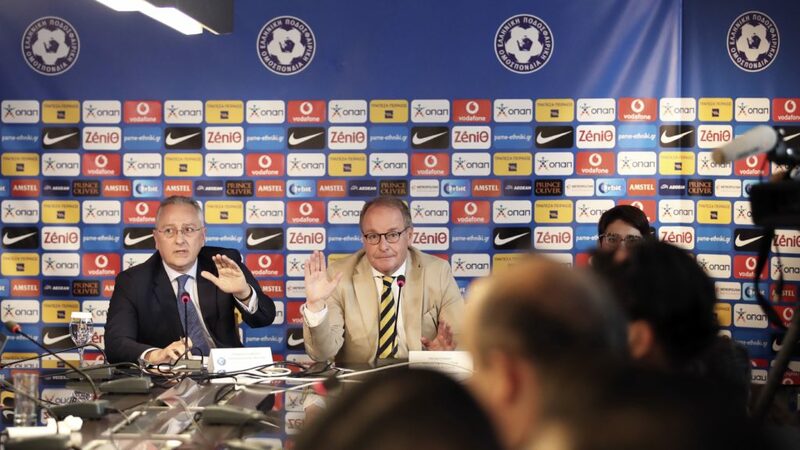 The ECA general assembly will meet in Rome in two weeks to consider its next step with regards to the Thessaloniki club. Meanwhile Greek football fans must wait to see what disciplinary measures FIFA takes against the Hellenic Football Federations and what measures the Greek government, the EPO and the law will take. At Wedneday’s news conference, FIFA representative Huebel said “We all love football but it’s unbearable that people are scared to go to a stadium. How can you bring children there when there are guns on the pitch? In 2015, FIFA, together with UEFA were at loggerheads with the Greek government over the government’s proposed anti-violence laws which FIFA and UEFA claimed interfered with the EPO’s independence. The FIFA Monitoring committee chairman said he would make his report to FIFA in about 10 days. EPO president Evangelos Grammenos added league officials are currently drafting a declaration against violence to be submitted to the Greek government by March 23. Pending the draft declaration, the government will then review its decision on the suspension of the Greek Super League. Meanwhile public prosecutors have launched a judicial investigation into the events on Sunday in Thessaloniki and in particular why police didn’t arrest Savvidis on the spot when they were allegedly under orders to arrest anyone threatening or carrying out violence. PAOK owner Ivan Savvidis invades pitch with holstered gun!